The Thermo Scientific GENESYS 180 UV-Vis spectrophotometer. The range includes the Thermo Scientific GENESYS 50 UV-Vis spectrophotometer, which features a simplified user interface and a high-resolution, color touchscreen. The exterior is built for repetitive and heavy use environments and is designed with sloping surfaces to shed spills. 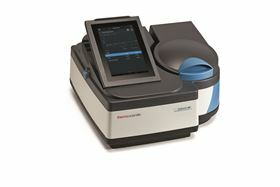 The Thermo Scientific GENESYS 150 UV-Vis spectrophotometer includes the same features as the GENESYS 50 spectrophotometer and provides automation for high-throughput options and room-light resistance, allowing lid-open operation designed for improved speed and convenience over previous generation instruments. The Thermo Scientific GENESYS 180 UV-Vis spectrophotometer includes all the capabilities of the GENESYS 150 spectrophotometer along with an 8-cell changer for higher throughput environments and double-beam capability for advanced experiments with a changing reference. The Thermo Scientific BioMate 160 UV-Vis spectrophotometer also includes all the benefits of the GENESYS 150 spectrophotometer and adds pre-programmed methods to help life science researchers obtain their answers quickly. This story is reprinted from material from Thermo Scientific, with editorial changes made by Materials Today. The views expressed in this article do not necessarily represent those of Elsevier. Fibermaq, a Brazilian specialist in equipment for composites molding has developed a new spray nozzle for its Evolution range of spray-up machines.